Lame, I know. 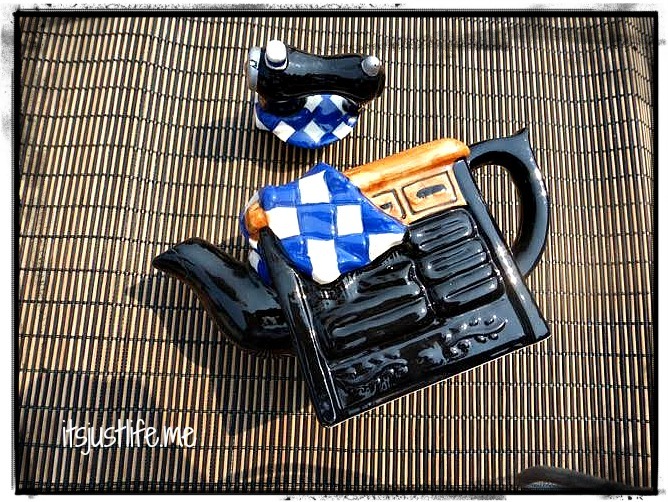 I am trying to spice up Teapot Tuesday a little bit and as this is moving week I may be a bit punchy about now. 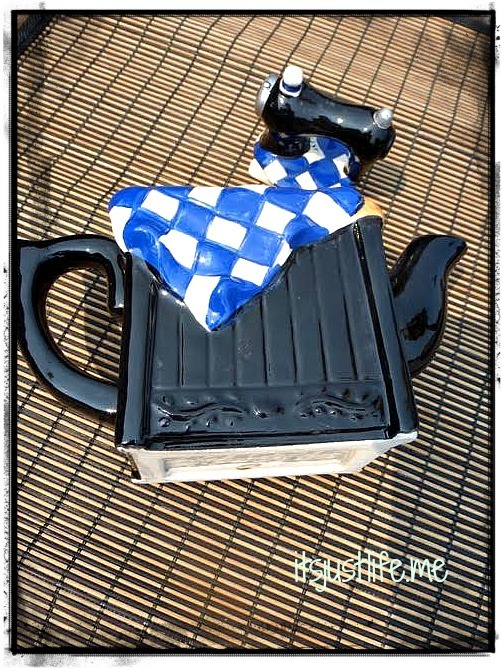 I am not sure how the next month or so will go with Teapot Tuesday since I will be in limbo for a bit but I will give it a good try to post something that will draw you in every Tuesday for more teapot madness. But for today enjoy this little gem I found a long time ago on eBay. A cute little sewing machine teapot that is more decorative than functional but that is okay as well, right? Just big enough to brew a cup perhaps but small enough to fit in a little nook on a shelf in the china cabinet. Tell me what you think of this one. The beauty of scheduled posts. I am actually a couple weeks ahead so it is all good. Plus I will have a month before we actually move in so I am planning a lot of writing during that time!! Thanks for stopping by. Good luck this week Beth Ann…always a stressful time! 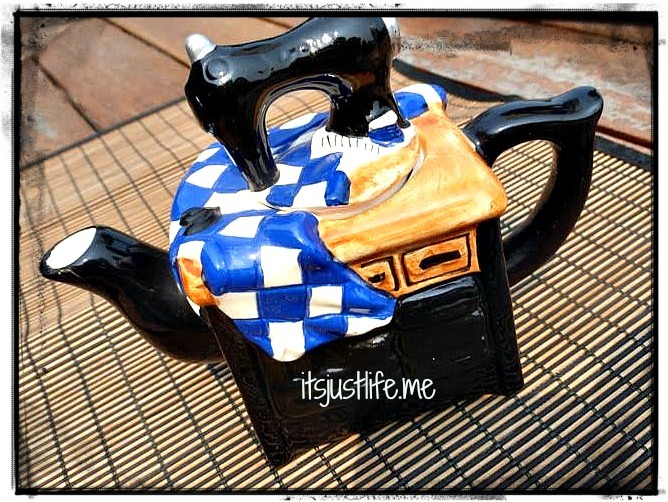 This teapot reminds me of you and our sewing Halloween costumes!!! Such a cute teapot. lol I dont believe Seth ever mentioned the mask…we were such mean moms!!! Seth was sad I sold his costume in a garage sale move! I was all about safety and they did not like that ! 🙂 Still bring it up to this day! Not my cup of tea. But then variety is the spice of life, right? I also applaud your blogging during a big move. I am actually ahead of schedule. What the heck is wrong with me? Where will you unpack your boxes? I should ask you about Australia TV sometime. Hey thank you for stopping by! Great to hear from you! We are moving to North Carolina. Chris’s job has him traveling and not located at any one place for too long so we got to pick where we wanted to live and we are moving to the Brevard area in August. Can not wait. Congrats on the new gig—sounds like a perfect fit for you! I agree. Love your play on words. Thank you for your kind words on our move. Just waiting on the moving van right now. I am not good at waiting. I am ready to go! 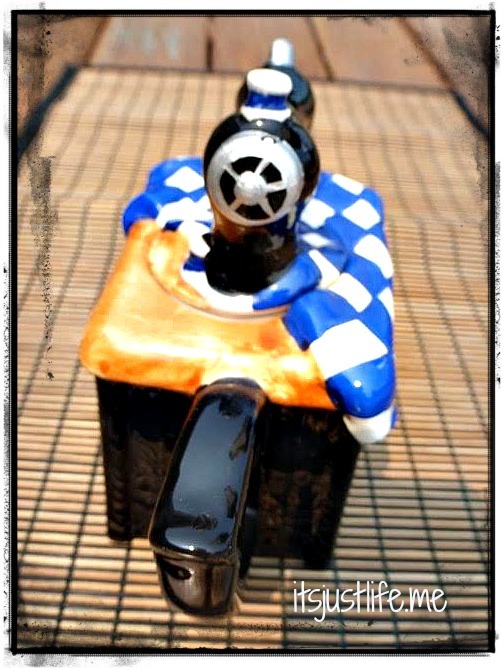 This teapot brought a huge smile to my lips. I used to sew all my own clothing (before I decided to write in my spare time) This would have been a perfect Teapot for me. I also love the Irish blessing.